We see a lot of customers wearing yellow safety jackets at the home, farm and auto supply store. Mostly they seek something to complete a project. Road crews, construction workers, and tradesmen of every kind stop in wearing the bright, reflective safety gear. It is mostly men. Usually, they are in a hurry to get back to work. The similarities between these Iowans and the French citizens protesting an increased fuel tax seem mostly external. 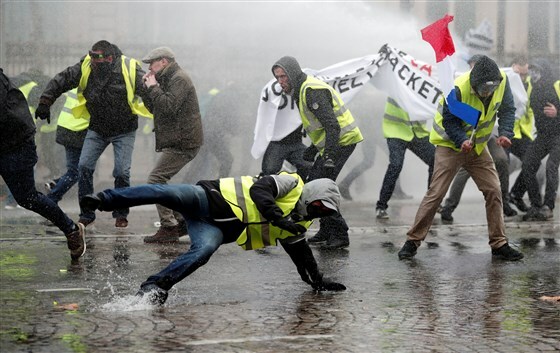 The French are required to carry yellow jackets in their vehicles in case of a mechanical breakdown on public streets and roads. Before I began working at the home, farm and auto supply store I thought only fire fighters wore such reflective clothing. What makes our yellow jacketed citizens different is the Trump administration is creating massive changes in financial matters that impact them and who cares? Where are the protests? For the most part Americans play the hand dealt in subservience. Take interest rates. On our last statement before the president was inaugurated, our annual variable interest rate was 3.00 percent on our home equity loan, indexed to the Wall Street Journal published rate. Our current rate is 4.75 percent, an increase of 58.33 percent. Where is the outrage? Take gasoline and diesel prices. On Dec. 10, the average U.S. price of gasoline for all grades was $2.511 per gallon with diesel at $3.161. During the same week in 2016, gasoline was $2.347 and diesel $2.493. The price of gasoline increased 6.99 percent and diesel 26.80 percent under this administration. With U.S. oil production hitting record high levels last month, why aren’t gasoline and diesel prices coming down? I don’t really expect answers because I know them. Interest rates and oil prices are just not on the financial radar for most people. They are an assumed background noise. Something that has to be dealt with, but not very often. Importantly, American businesses have learned how to change things in their favor without precipitating the kinds of protests we see in France. It is a basic part of corporate pricing policies. The protest in France is about fuel prices. During the first Gulf War I worked for Amoco Oil Company, where we were acutely aware of the global political situation as it related to discovery, development, refining and selling our products. I managed a small trucking fleet and fuel price volatility during the war led us to implement a fuel surcharge in our contracts with customers. We weren’t the first to implement a fuel surcharge but today they are a hidden part of almost every type of delivery service. Depending on a customer’s savvy, fuel surcharges can be negotiated to produce an additional margin for operations through various pricing schemes. As suggested, it’s just not on the radar for American yellow jackets. Interest rates? You gotta be kidding me. It’s been a long time since I was in France. I’ve never understood their politics the way I do ours. Is Macron good or bad, or just another president in a series of controversial figures? What I do know is Americans rarely make the news for our protests. That is more newsworthy than what the yellow jackets are doing in France. This entry was posted in Social Commentary, Writing and tagged #amwriting, sustainability, Writing. Bookmark the permalink.